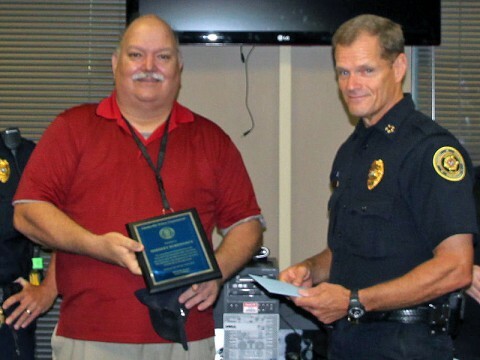 Clarksville, TN – On Wednesday, July 2nd, 2014, Chief Al Ansley from the Clarksville Police Department presented Herbert Burkhardt with a Plaque for his outstanding and dedicated service to the Clarksville Police Department. Mr. Burkhardt has volunteered his time to assist the CPD staff over the past seven years. His dedication to this department and the citizens of Clarksville is truly appreciated. On behalf of the Clarksville Police Department, Herbert Burkhardt will be missed. Herbert Burkhardt (left) is presented a Plaque for Outstanding Service by Clarksville Police Chief Al Ansley (right).